Pseudosphinx tetrio caterpillar as feeder? Discussion in 'Tarantula Questions & Discussions' started by Matoutou, Aug 9, 2017. Has anyone ever fed one of these to a tarantula? It does indeed look scary for some reason. Is this something you found outside? If so definitely don't feed it, it could be contaminated. You never know what it's been in contact with, and/or what it's been feeding on. It is indeed found in my garden. There are hundreds of them and they just ravage any plant or fruit tree they can find.They exclusively feed on healthy green leaves until all that's left is a dying tree. We usually kill them with no mercy. I was hoping they could end their lives doing something useful. Exactly as @Nightstalker47 said-- do not feed your T insects you found outside, even crickets! Contamination, possible exposure to pesticides, and potentially even parasites. Only feed insects bred for feeding purposes. Sorry feeding them to your Ts isn't an option. We have -tons- of Japanese beetles each summer that devour our roses, hibiscus, etc. They just all swarm a flower in alarming numbers and then eat and do 'grown up leap frog' all willy nilly. Wish I could catch them and feed them to Ts, they're so plentiful and free. But there are way too many things that could go wrong offering a WC feeder insect. Thanks for your replies. Guess I'll stick to the classics. We're also invaded by scolopendra gigantea. One of the most priced here. We have them in the house and I really wish I could pack them all and send them your way. It's really not worth the risk, captive bred feeders are widely available so there's no reason to feed WC prey. Not really, pesticides can be transported miles away from where they were sprayed through wind. Also, depending on what feeders your catching they may have the ability to cover great distances(winged insects) and you have no way of knowing what they may have come in contact with. That's a lot of money ! Would be a lot of millipedes and tarantulas ^^. @Matoutou lives in a invertebrate paradise for our circumstances. I think the same when millipedes are shown that live in USA and can be caught by making a walk. Chris! You have scorpions in your environment ! Without protection ! In Austria they are protected, I can't collect them from the wild. The caterpillar looks to me like it is poisonous, I wouldn't feed it to tarantulas. I did more research. Turns out this caterpillar isn't poisonous but it's got a nasty bite when bothered. I'm not risking it with my tarantulas. Ah I see... I forgot a "s", sorry. Customs. Customs inspections (of the parcel) that technically can happens. Ah, I see. Customs are the nice people who collect the taxes on the borders ^^. Never underestimate the speed of a turtle or tortoise!! When males notice a female, they can be unbelievable fast!! And turtles are the water-living-species, they can attack very fast ... .
About the scolopender we talked last week. The true spiders you can keep by yourself, widows are not my thing . But the tarantula is nice. It looks a bit like my Phlogiellus baeri ^^. 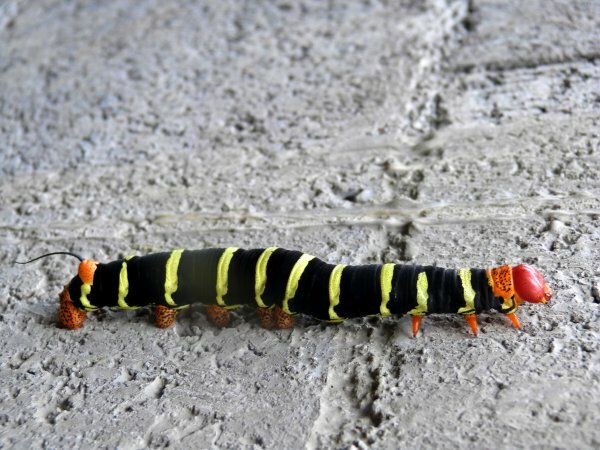 Biting caterpillars are already as bad as poisonous ones. One possibility could be that you crash the head of it . But as the others say, it is always a risk to feed wild caught feeders.